The new Sony mid-level flash unit is the best that Sony or Minolta has ever produced. It has a fast recycle time of less than 3 seconds at full power, 4 second modeling flash, a 15mm wide panel diffuser, (look for a 10mm-? zoom soon), customizable multi-flash emission, weather sealing, (I don't see it), a total of 22 power level adjustments 1/1-1/128 with increments of 0.5 or 0.3, your choice, and last, but not least, it can be used as a controller for multiple flashes in optical wireless mode. The large range of power level adjustments are great for close work, and lighting small rooms. I sometimes use 1/32 power in a small bathroom as an accent, and find it's too much light, so being able to adjust the light down to 1/128 is very useful. Sony Finally has a flash unit that's comparable to a good Canon or Nikon. Believe it or not, the more expensive Sony HVL-F58AM doesn't have the same level of power adjustments the HVL-F43AM has. I'd be nice if it had a warming filter pack, and the ability to sense when a filter has been attached, and automatically adjust to the proper white balance, but maybe that'll be for the next new flash. Sony went and changed something from the old HVL-F42AM, and that change allows the new flash to work great with Radiopoppers™ right out of the box! The Sony HVL-F43AM is a great performing little flash unit, that's why it's on the recommended accessories list! *A brand new NEX-5 bundle* (18-55mm, 16mm, an 8gb card and nice padded carrying case) for $599! Offer ends Sunday the 27th! The latest NEX-5N is $599 for the body only! Want a NEX-3 camera for $399? B&H photo has a used one in '9' condition, it's red with a 16mm lens and comes with the box. If you want the latest NEX-C3 you pay hundreds more for a little better high ISO performance. 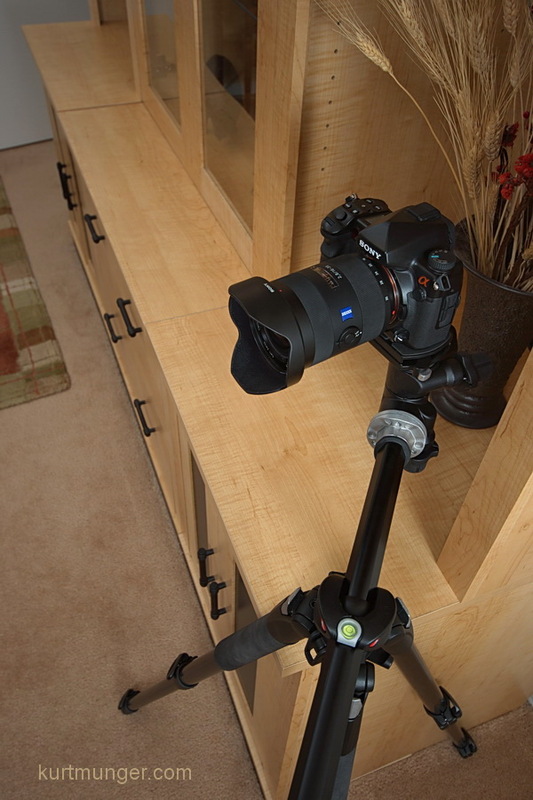 Manfrotto 055XPROB tripod and 410 geared head review. I bought a new tripod and head a few months ago to replace my carbon fibre tripod with three way pan/tilt head. Carbon fibre tripods are nice if you carry 'em around all day, but sometimes they can be too light. My model wouldn't hold its position well on smooth flooring, and the long handles on the head interfered with some tight shots, such as when you have to be really close to a wall or door. The Manfrotto 055XPROB tripod is well built, has rubber feet that hold very well on slick surfaces, along with a neat feature of being able to move the center column to the horizontal position without removing the camera or head. This feature really helps out when you need to back up just a little more for those small rooms, or getting the camera close to the ground for macro stuff. The tripod is very solid with a load capacity of 15lbs (7kg). For those of you with deep pockets wanting a horizontal center column with more adjustments, check out this tripod. The Manfrotto 410 geared head uses short knobs for adjustment, with the inner slim knobs for quick set-up. I also like the small footprint in the carrying bag, as there are no handles to get tangled up with light-stands etc. The two items also come as a B&H photo kit, meaning the tripod and head together, although the price is about the same if purchased separately. There's a rebate available now through Jan 15th if you're interested. I put up a new page to give you some ideas on how to make better pictures during, (and after) the holiday season. Most items were culled from the other two 'recommended' pages, although I've added a couple of new items too. Here you'll find accessories like neutral density, graduated ND, and polarizing filters, flashes, and to a lesser extent lenses (farther down the page). Pros use those relatively inexpensive items to make their pictures 'pop' but most amateurs aren't familiar at all with when and how to use filters and flashes, my upcoming blog will explain all that soon. This page is slightly different from the two other 'recommended' pages in that the new page is more for beginners, and most (but not all) products are inexpensive, but are a great value. I've included a couple of cameras that I like, and think they're worthy of purchasing, but here's the thing: if you already have a good DSLR/SLT/NEX camera, and aren't getting decent looking pictures, you don't need to buy another camera. Spending hours in photoshop trying to make chicken salad out of chicken s**t is pointless. A new camera will take the same crummy pictures as your old camera. Save your money for some important image improving accessories like the things mentioned above, plus some books on composition and lighting. The recommended page isn't my wish list; I don't recommend stuff I don't believe in. Most items on the new page I use daily or weekly for business and pleasure. This isn't dpreview where there are no actual photographers, just professional writers, (look at their samples gallery from a $10,000 camera), all the while recommending everything that hits their homepage. Finally, I think I have a huge amount of useful information on Sony camera equipment and accessories, plus many general photography how-to articles. I spend all my free time adding useful material to this site. If I've helped you out, please consider donating directly, or use my links to B&H photo when you purchase something. If you aren't sure you want to buy something right away, you can put the item in the B&H shopping cart; I'll still get credit if you buy it later, thanks! Here's another sample shot from a Real Estate shoot. It's also similar to another shot from a few months ago, but I guaranty it's not the same one! 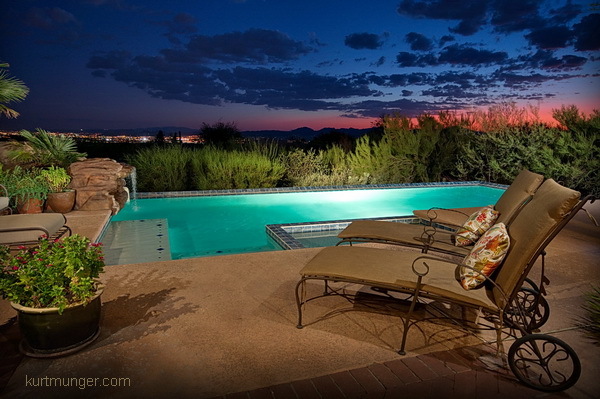 Upscale homes in Southern Arizona almost always have a pool with a view. In the boring top shot I had a house flood light at the upper left, and the fading sunlight to work with. I could've used a longer exposure to better light the foreground, but the sky would be blown out on the right side. 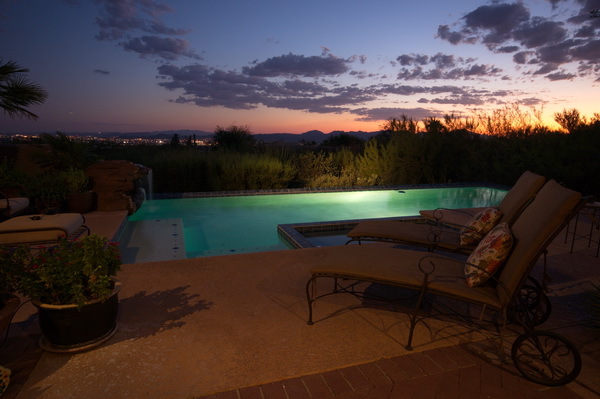 In the bottom shot I used about 7 off-camera flashes to carefully light the pool perimeter. The most important light was probably the one over the two lounge chairs, pointing down at the pillows, you can see the additional shadow it created. In post I cropped the image slightly, did a mild levels adjustment, and burned (darkened) the bottom left corner area to cover the white stained cool deck. I should've moved the potted plant to cover that area a little, but I had three other twilight shots to do, all in about 20 minutes, so there was really no time nit pick the scene. The time difference between the top and bottom shot is 10 minutes, that's how long it took to get the final lighting configuration. Specs: Sony A580, Sigma 10-20mm F/4-5.6, 15mm (22mm equiv), F/7.1, 3.2sec, ISO 200, Auto white balance. Howdy! Things are slowing a bit in the interior Photography world, so I'm back to spending more time on this website. I now have everything updated, such as the lens chart, DSLR/SLT specs page, and the NEX camera specs page, the used price guide; and I've added a new page for the old Minolta AF original selling prices, because many people asked me to do it. The new page is linked from the 'miscellaneous' page, under Minolta AF lenses original retail prices. I also added to that a magazine ad image sent in by a reader that shows the prices of many Minolta AF lenses and a couple of cameras; I think it's probably from the late 1980s and a NY city discount dealer like B&H, Adorama etc. All the new Sony Alpha and NEX lenses will probably not be reviewed until after the new year. Most aren't available separately yet, or aren't available at all right now. I might squeeze in a Sigma or Tamron lens review before the holidays. I'm planning a X-mas shopping list of items I find useful, at a good price, so look for that very soon. I'm now working on a review of the Manfrotto 055XPROB tripod and Manfrotto 410 geared head. Both are offered here as a kit for the same price. I bought both a few months ago, and really like them, especially with the current mail-in rebate price. Get yourself an early X-mas present. SanDisk went and lowered the prices on its flash cards today. Video junkies and serious shooters might want to check out the 32gb card, it's $51.95 with free shipping. I bought the same card last year for twice the price. A very economical choice is the 16gb, $25.95, which records over 1000 RAW shots (941 est by camera) on my A580, (or over 2300 fine JPEGs). If you're on a budget, or just want a cheap spare card, the 8gb card is only $15.95. All cards ship free in the US. 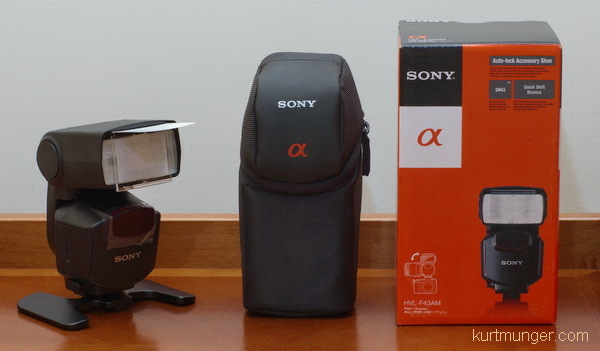 If you have an older Sony camera which uses Compact flash, go here.